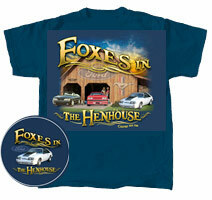 Mustang "Foxes In The Hen House"
Highly Detailed small artwork of the white third generation 1985 GT Hatchback Fox body Mustang on the front left hand side chest of this Tee, and with the Western style scripts “Foxes in the Hen House” in the background. The script colours phase from Yellow to Orange along with western style pin striping. We have here the third generation of the Ford ‘Fox body’ Mustang’s on display, parked up in a “barn” themed scenario. Starting from the left of the artwork, we have this fine 1987 GT 5.0 convertible in its original un-restored dark blue hue. The detail of the is artwork is outstanding. The correct front grille arrangement and wheel trim details are correct, note the white interior and soft top roof. Alongside the beautiful ’87 is this magnificent ’82 GT. This red beauty displays the front end detail of this era from the ‘egg crate’ grille, dual headlight assembly and the sports front bumper spoiler with the additional driving lights...Totally eighties here folks! Lastly, is this beautifully presented 1985 GT Hatchback in gorgeous white duco (no black out on the hood as per picture). The detail is well presented, showcasing the factory T-top roof configuration and the factory 10 hole cast alloy rim pattern. The background of the Tee illustrates the bold brilliant colours of a country Barn in an evening scene, with overgrown greenery, and the images of the Ford manufacturers Mustang badge emblem scripts on the walls of the Barn. The colour of the script “Foxes in the Hen House”, phase from Yellow to Orange along with western style pinstriping, across the back of this t-shirt. T-shirt colour available in Navy only with Genuine FORD official merchandise tag decal.